Nicholoy asks if Miss Berry would meet Wednesday evening for the Cosmopolitan Club. 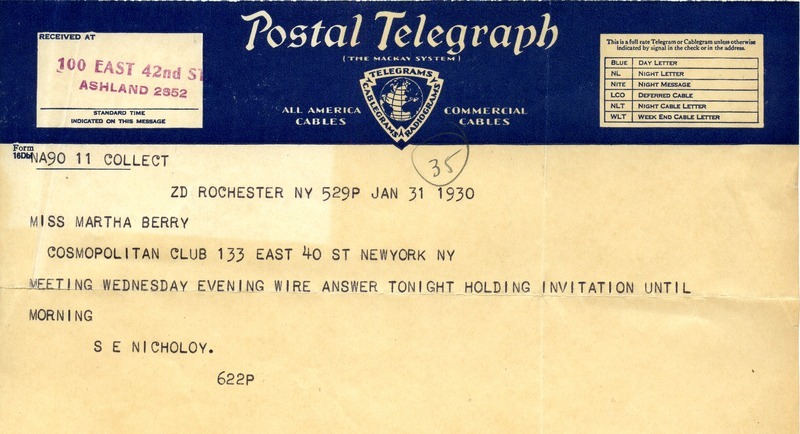 S. E. Nicholoy, “Telegram to Martha Berry from S.E. Nicholoy.” Martha Berry Digital Archive. Eds. Schlitz, Stephanie A., Rachel Renaud, Chelsea Risley, et al. Mount Berry: Berry College, 2014. accessed April 20, 2019, https://mbda.berry.edu/items/show/13547.